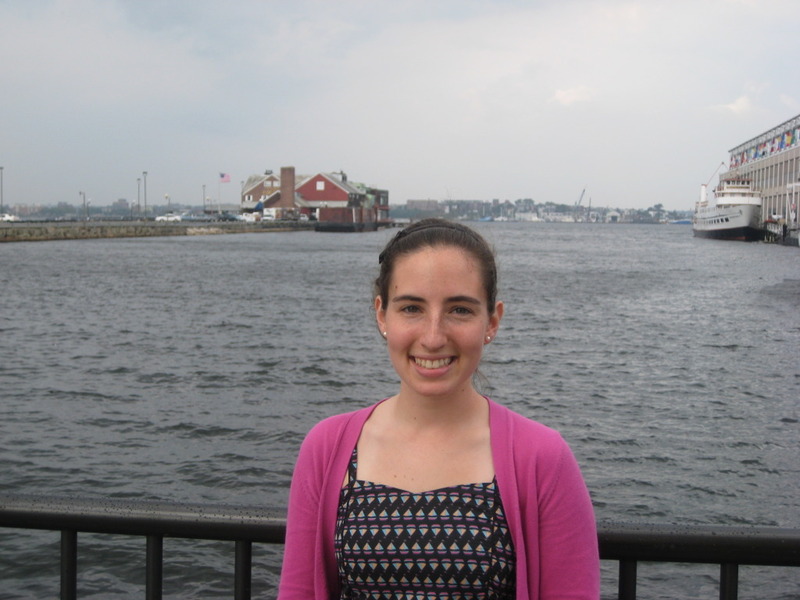 Hi everyone, my name is Cathy and I am a new intern here at Save the Harbor Save the Bay. I am studying environmental science at Emmanuel College and am on the pre-law and policy track. I am more than happy to be joining the team at Save the Harbor Save the Bay. I had discovered the organization on my school website and immediately wanted to help. The success of Save the Harbor Save the Bay truly inspired me. Creating me to believe that it is possible to maintain a clean environment afterall. The other interns and I were lucky enough to get the chance to walk around the harbor and explore the beautiful harbor. 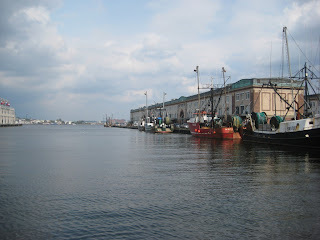 It was a great experience walking around Boston Harbor because I am not familiar with the area at all. Yes I do go to school in Boston, but I have never had the chance to take time out of my day to explore one of the most beautiful parts of the city. Seeing how amazing the harbor is really made a great impression on me. Living in the city really creates me to miss nature and exploring the great outdoors. 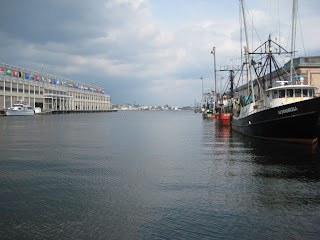 Being at the harbor brought back that warm and adventurous feeling that was hidden inside of me. It was a lot of fun exploring with the other interns. The surrounding area is filled with so many great places, including Jerry Remy's, the Bank of America Pavilion, and Anthony's Pier 4. It was a very difficult decision as to where to get lunch with all the great places to choose from. We ended up getting authentic Italian panini's at J. Pace and Son, which I will honestly say made my day that much better. It was difficult to leave our adventure to go back inside, but after getting stuck in the rain it was a relief to get back to Save the Harbor Save the Bay. Overall I really enjoyed exploring the Harbor. 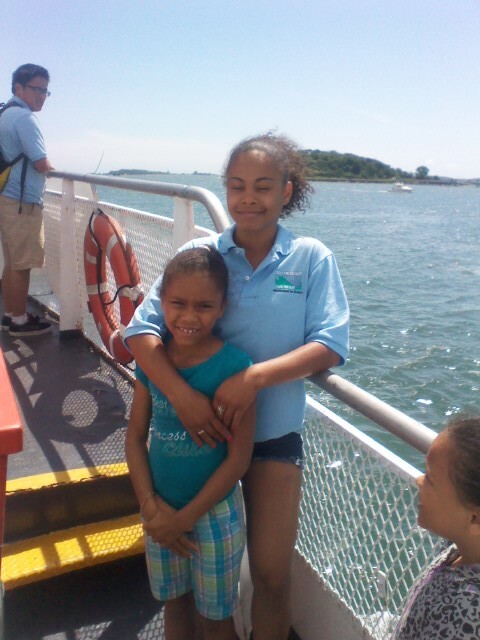 It allowed me to appreciate Boston Harbor and inspire me to keep it as beautiful as it has become. It feels great to be apart of such an amazing organization that will allow me to keep the the environment clean, and in turn, allow others to enjoy the beautiful harbor. I'm Ariana and I am very excited to be joining the team at Save the Harbor/Save the Bay as a policy and communications intern this semester. 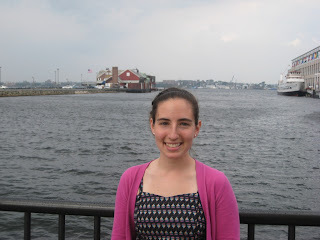 I am a Senior Environmental Studies/International Affairs major at Northeastern and am anxious to learn more about how Save the Harbor works to make the Boston Harbor and a better place for everyone to enjoy. Last week, some of the new interns and I took a stroll around the waterfront to acclamate ourselves and take in the area. Boston's Seaport disrict combines an interesting melange of city, waterfront, and everything in between. The open air and sea breeze are a refreshing change from the busy streets downtown. From the Fish Pier's cheerful seafood distributors greeting you in the morning, to the breath-taking views of boats and tall ships lining the docks, to the sheek, new restaurants and bars lining the streets, the area has a little something for everyone. We made our way down to Anthony's Pier 4 and I quickly realized how many Boston landmarks I still have yet to visit - even though this is my fourth year as a student in Boston. Now, I will have no excuse not to visit the Atlantic Beer Garden or the ICA (Institute of Contemporary Art) since they are practically right next door. We stopped for lunch at the very popular J. Pace restaurant and enjoyed some delicious Italian sandwhiches and calzones before getting stuck in the rain and hail storm. It allowed for some people-watching as tourists, businessmen and women, and retired locals passed by. When weather cleared up and it was safe to venture outside again, we continued our stroll and noticed the stark contrast between the old, abandoned brick building and the newly-opened stores and restaurants - a sign of the vast transformation the Boston Harbor has seen in the past few years. I am excited for my work with Save the Harbor/Save the Bay to begin and look forward to spending more time in this beautiful area. 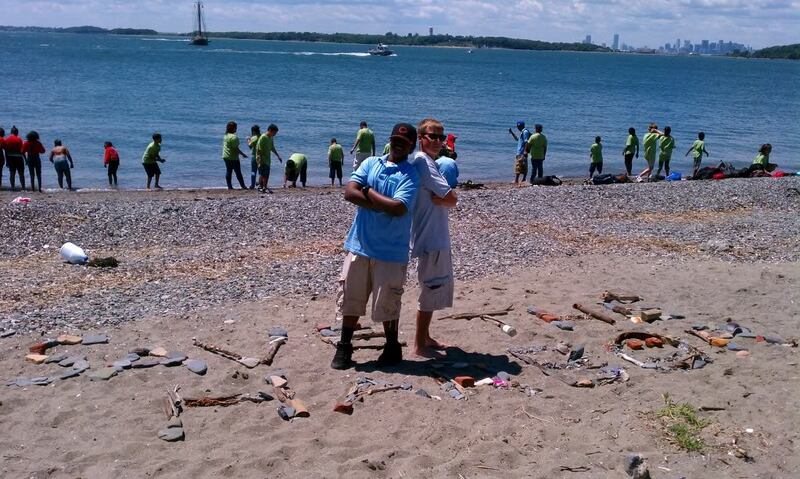 Yesterday, Save the Harbor /Save the Bay hosted a beach clean-up in South Boston for nearly 100 Blue Cross Blue Shield of Massachusetts employees. 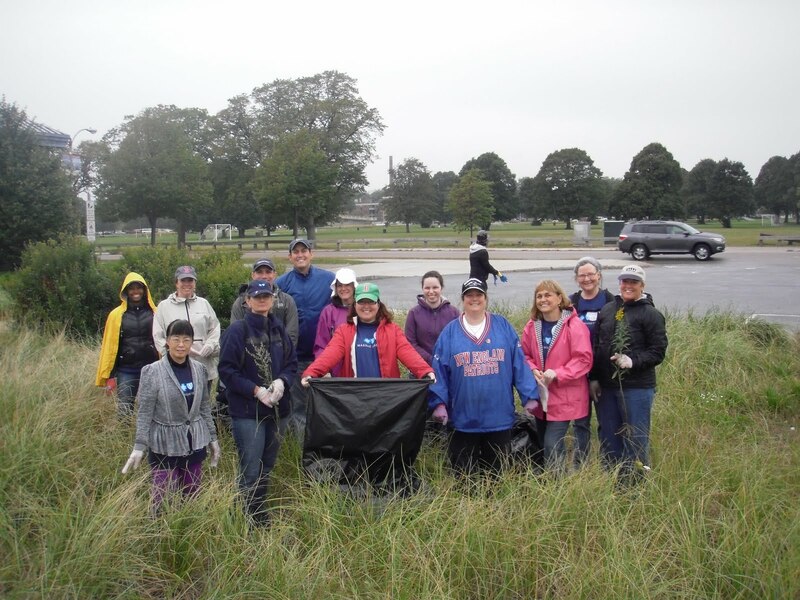 Despite the rain, members of the “Blue Crew” were energized and excited to be out of the office and on the beach helping Save the Harbor and the Department of Conservation and Recreation (DCR) address the need for clean, usable beaches not only in the summer but in the spring and fall as well. The day kicked off with a few words from Save the Harbor’s Bruce Berman, a visit from Senator Jack Hart, and a spirit cheer led by one of the Blue Crew members. 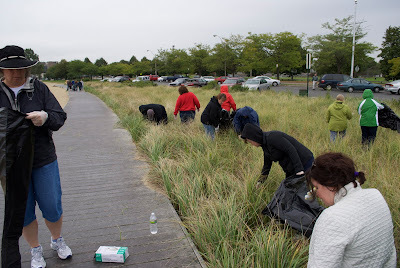 DCR’s Jack Kelly then instructed the employees on their tasks for the day, some of which included trash clean-up, weeding, and moving of displaced sand back to the beach. As the clean-up began, it was obvious how passionate the employees were about their service day – one employee even continued to pick up trash during his lunch break! During their lunch, Karl Pastore from DCR thanked and encouraged the crew as they prepared to head back out into the rain to finish the clean-up. By the end of the day, the beach looked incredible and everyone was exhausted! It was wonderful to see how enthusiastic everyone was—and how much fun they had-- regardless of the bad weather. 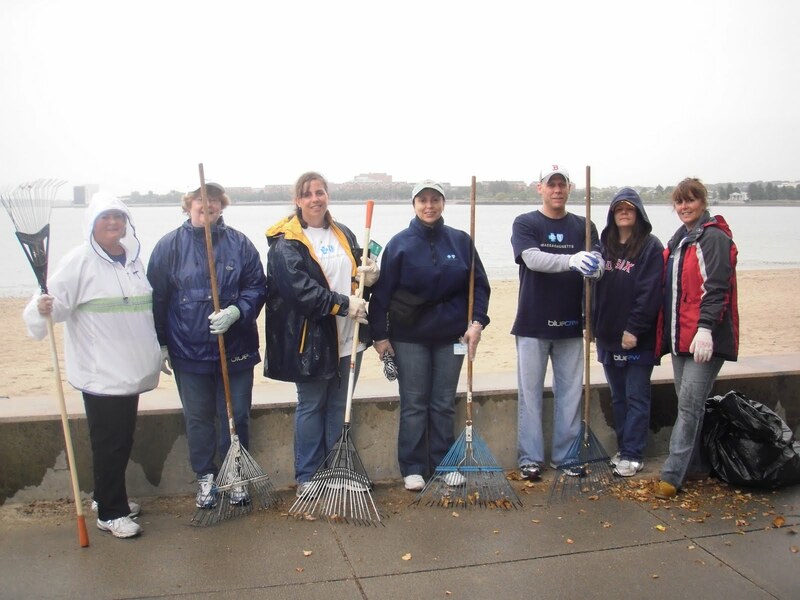 The beach clean-up was part of Blue Cross Blue Shield of Massachusetts’ inaugural company-wide Service Day, powered by BlueCrew, BCBSMA corporate volunteer program, and inspired by the vision and goals of the community. Blue Cross Blue Shield had over 3,000 employees engaged in locally-designed projects across the Commonwealth. 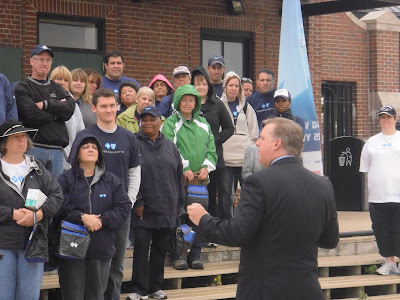 Save the Harbor was lucky enough to be chosen as one of BCBSMA’s non-profit partners for the 2011 service day. We can't thank Blue Cross Blue Shield enough for all of their dedication and hard work and can't wait to work with them again in the future! It may be September already, but the beautiful days to enjoy our Harbor and our beaches certainly aren't over yet! And nobody knows this better than our Better Beaches groups- who are working to bring their communities to their beaches throughout the entire year. Our friends over at the South Boston Neighborhood House hosted their second "Family Fun Night" of the summer on September 2nd, reminding us that summer isn't over-- there's plenty more fun to be had, and plenty more memories to be made, on our beaches this year! 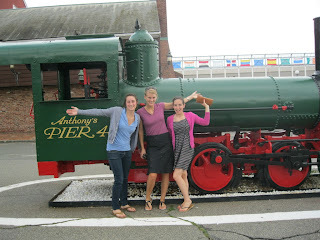 Sarah Appleton and I headed over to McCormick Bathhouse for Family Fun Night - one of my favorite Better Beaches events. The Neighborhood House consistently creates events that are shining examples of what the Better Beaches program is about: They've received just a small sum from the Better Beaches Grant Program (which the South Boston community raised themselves this year at the Cupid Splash!) and they've leveraged it into something so much bigger, tying in so many more pieces of the community and bringing families together against our favorite backdrop: the Harbor. 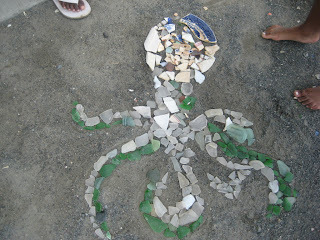 Kids and their families listened to a local storyteller, created paintings and spin art with local artists, played on the beach, danced to the DJ, ate, and spent time together. Boston Public School representatives were there with information for parents about the new year, the South Boston Community Heath Center was on hand with information about healthier lifestyles for families, and Sarah and I were there providing some marine science. But my favorite part? Super Duck Tours donated free rides to and from Castle Island in the Super Duck Boat, an exciting new way for families to experience the Harbor together, and a great example of expanding the vision and creativity of what a Better Beaches event can be! The South Boston community, and all of our Better Beaches groups, do a phenomenal job with pooling and leveraging what they have and what they are given through their grants. They don't just say, "We have this amount of money, what can we do with it?" They ask: "What are our resources as a community?" and "Who else can get involved?" It's really amazing to see what they create and who joins the fun. The sunset brought some chilly air in South Boston, but the party continued. I know that some of my favorite memories as a child were on the beach on nights like this, late in the season, wrapped in a sweatshirt, cold sand under my feet, seeing lights sparkle all around me across the water. And in those memories, I was always with my family. The South Boston Neighborhood House is creating memories like that-- time spent together on a gorgeous night as the summer dwindles. I'm very proud to be a part of giving families the chance to make these memories together. But hold on.... these kids get duck boat rides, storytellers, and spin art? Little elementary-school me is very, very jealous. 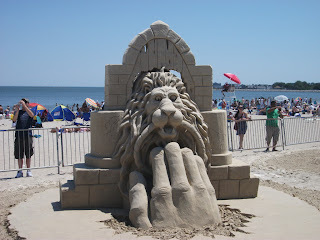 Hope to see you on the beach all year round! This summer was the greatest and most adventurous summer I have ever spent with Save the Harbor/Save the Bay even though it was my first with them. Starting with the staff members: it was great working with you guys. You all have some great personalities and are the best to work with. I had a wonderful time with y'all. 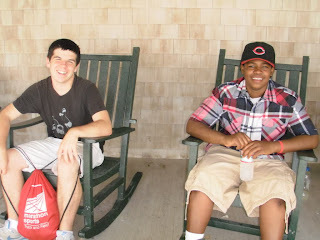 The kids I have met over the summer are so much fun and are always joyful. I have learned so much from them, and they also learned a lot from me. This summer I visited so many places that I never been to and never taught I would. This job have given me some great qualities and I am very grateful of that. It was a pleasure working for Save the Harbor this summer and I will always remember each and everyone of you. "This is great now I'm crying"
Save the Harbor/ Save the Bay has been one of the most exciting job experiences I have ever had. This summer was filled with enthusiastic and motivated workers, who put the true definition to working together. I am still in disbelief that it's all over. The day of my interview made me extremely nervous because I didn't know what to expect. I was worried I wouldn't make friends and I'd have a hard time adapting. Luckily I didnt; I wanted to especially thank Michelle, Brianne, Sheuli, Paula, Sarah, Will, Carolyn, and Tommy for being great comrades as well as outstanding SME's and LE's. If I could change anything this summer, I would keeep it all the same because it turned out ten times better than expected. For the first time, I went sailing and I also went kayaking. Places like Courageous Sailing Center, Piers Park, McDonough Sailing Center, and Community Boating were all new places to me. I never knew these places existed. The most memorable part were the children; before working here I didn't know the first thing about fishing or crab trapping. Before this summer I had never been fishing a day in my life. Now, I can start my senior year of high school knowing I've learned knowledge I can pass on. I can now appreciate the harbor alot more and tell people things I didn't know at one point. Close friends I made include, Leon, Will, Aruna, Mark, Dianna, Christina, Cassie, Latoya, Huges, Tommy and Connor. Thanks everyone, for making my summer fun and memorable...I hope we all keep in touch! Well harbor explorers, it's that time of year again. 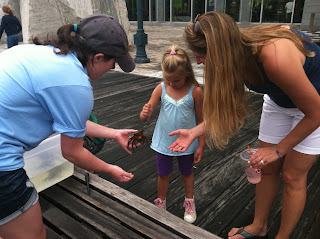 Eveyone is heading back to school and Save the Harbor, Save the Bay has wrapped up the summer programs once again. I was very busy this summer -- from leading groups to Georges' and Spectacle Islands to crabbing at the McDonough Center to hosting a beach party at M Street beach in South Boston -- and now that I've had some time to sit back and look at the whole summer, I can confirm that it was pretty amazing. Not many people get to be outside near the water all day and get paid, or to work with such great children and staff, so I consider myself lucky to have found a place at STH/STB. Last summer was wonderful, and this year was just as amazing. I can never thank my co-workers enough -- I'm going to miss everyone! Special thanks to Brianne, David, and Michelle for being only a phone call away with help and advice. 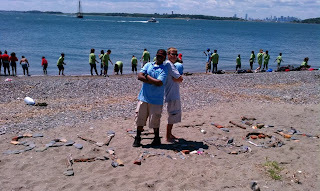 And there would be no Save the Harbor without Bruce Berman and Patty Foley -- thank you both for all that you do! For those of you who don't know, this is Save the Harbor's 25th anniversary. 25 years ago many of the neighborhood beaches in Boston were unsafe to swim in; today more and more children are playing and learning on the same beaches that their parents couldn't swim in. 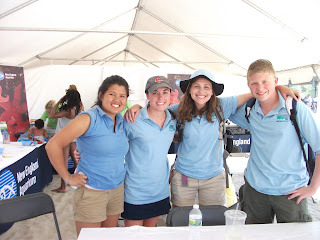 Save the Harbor has been working to better the lives of all Bostonians by helping to clean up the harbor and to expose a whole new generation to the wonderful resource that is our beaches. I hope that 25 years from now STH/STB will still be encouraging a love for the water in all of Massachusetts's children. PS: The pictures are all my favorites from this past summer!